Here is the hostess gift I made for my dear friend Tracy who recently held a Close to my Heart party with me. I've known Tracy for a couple of years - my youngest boy had pre-school with her youngest. We hit it off instantly as she is such a down to earth, honest and dependable person. We used to take our boys to McD's for lunch after school and sit and talk for hours. She is another of my blessings - supporting me through good times and bad. 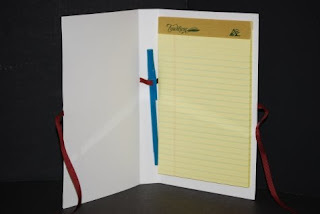 I like making these mini legal pad holders - there is a slit to hold the cardboard backer so you can switch out the pad when you are done with it. The butterflies are from the Butterfly Wings March Stamp of the Month from CTMH - the big one is embossed with Vineyard Berry and the little ones in Heavenly Blue. 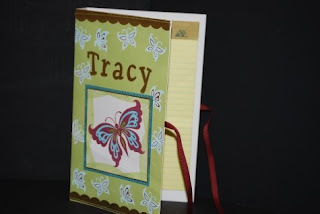 I used Gold embossing powder for the name in Giggle alphabet stamp set and a border stamp for the top and bottom. The paper started off as White Daisy but I had fun with the brayer and it turned into Sweet Leaf. This was one of those projects I had to play with for a while to get the look I was going for. Sometimes things flow and sometimes you have to keep adding until they look right! Here is the inside - there is a slit cut for the ribbon that his sandwiched between two pieces of White Daisy to make it into a pen holder.